Transforming growth factor-beta (TGF-beta) is a potent modulator of immune and neural cell function and plays an important role in neuro-immune interaction. TGF-beta is therefore considered an attractive therapeutic target in brain injury and neurodegeneration. However, the role of TGF-beta in disease is highly cell type- and context-dependent. Depending upon context, the activation of this signaling cascade has either beneficial or deleterious consequences. We have extensive experience in modulating TGF-beta signaling in a controlled manner to dissect the role of TGF-beta in disease and to harness the therapeutic potential of TGF-beta signaling modulation. Tools developed/used to study and manipulate TGF-beta signaling. 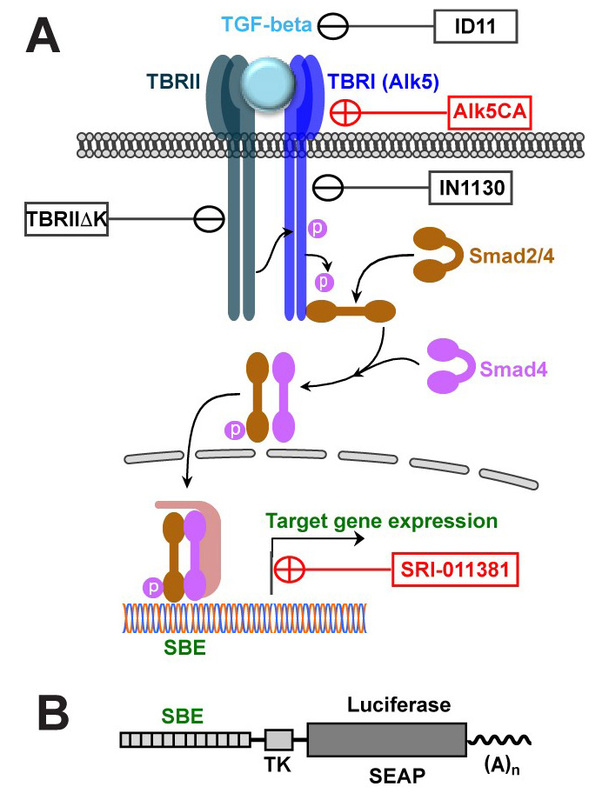 Ligand (TGF-beta) binding to the receptors (TBRI, TBRII) leads to phosphorylation of Smad 2 and 3, which form a complex with Smad 4, translocate into the nucleus and bind to Smad DNA-binding element (SBE) in target genes to regulate transcription. (A) TGF-beta signaling can be inhibited by using TGF-beta-neutralizing antibody 1D11 (J Immunol 2005;175:547), TBRI kinase inhibitor IN1130 (J Clin Invest 2007;117:3306), or with a truncated, kinase-defective type II receptor (TBRIIk) (J Neurosci 2017;37:4584). Activation of TGF-beta signaling can be achieved by using Alk5CA, a constitutively active mutant of Alk5 containing a T204D substitution (J Neurosci 2017;37:4584) or a novel small molecule activator SRI-011381 (US patent US9796674B2). 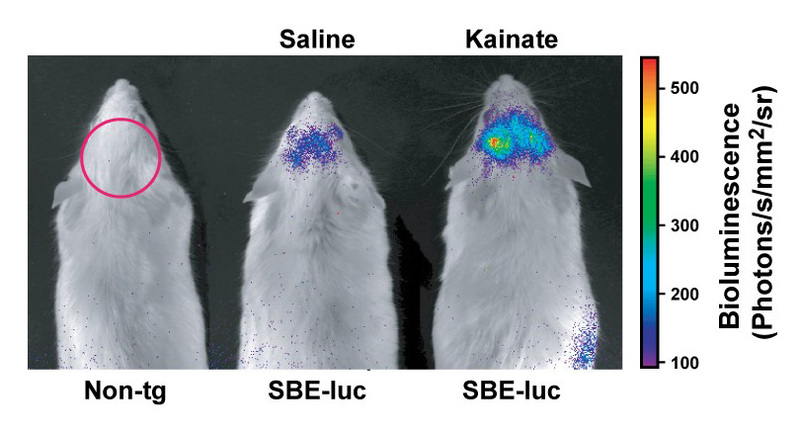 (B) Expression of luciferase or SEAP (secreted alkaline phosphatase) under the control of SBE promotor has been developed as TGF-beta signaling reporter systems. A nontransgenic mouse (non-tg) or SBE-luc mice (line T9-7) were treated with kainate (25 mg/kg, i.p.) or saline as a control and bioluminescence was measured 24 h later.